A photograph taken on the steps of Oak Hall, Haslemere showing Miss M. Keyte-Perry with Ch. Kara Queen, Ch. Surf, Ch. Dawn, Ch. Winter, Ch. Leader, Ch. Tchita, Ch. Riga and Ch. Loga. YOU cannot walk through the “ Arctic ” Kennels without realising that you are in the home of dog aristocrats. At lovely Oak Hall, Haslemere, which nestles snugly on the slopes of the South Downs, Miss Keyte-Perry´s Samoyeds have earned a reputation second to none throughout the world. And here, as in all other places where magnificent dogs are bred, you will find Bob Martin´s Condition Powders in regular use. Let Miss Keyte-Perry herself tell the story of her success with this beautiful breed. “ When a breeder is as successful as I have been there are always many people who attribute that success to an unusual amount of luck. Well, I say this, there was never a champion of any breed that was made a champion through good luck. No, there is only one royal road to success in dog-breeding, the road that I have followed consistently. You might, with little effort, be able to make a moderately good dog into a good dog, you might even be able to make a bad dog moderately good. But the real champions - the cream of dogdom - are, to a breeder who knows the business, recognizable soon after their birth. And then, only hard work and painstaking care can bring them up to the exacting standards necessary for a present-day champion. It is in this work that Bob Martin´s Condition Powders play such an important part. Regular conditioning brings out all that is best in any dog and no breeder who is really trying to obtain success can afford to dispense with this valuable aid. The “ Arctic ” Kennels are unique for their comfort and equipment. Built as little chalets, each housing two dogs, there is a long run for each kennel. All the “ Arctics ” are house-trained and the perfection of their training cannot be better demonstrated than by the fact that when I, a perfect stranger, walked round the kennels with Miss Keyte-Perry, not a bark or any other kind of noise greeted my arrival. 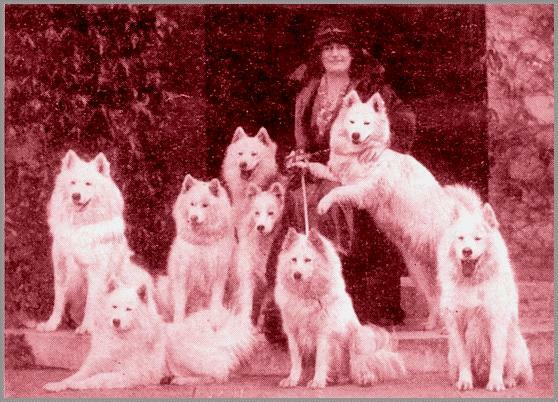 Rather did these pristine white ladies and gentlemen of Siberia extend paws of welcome to me with the gracious and aristocratic bearing that only Samoyeds can boast. “ The Home of Champions ” they call the “ Arctic ” Kennels. No finer tribute for Bob Martin´s Condition Powders could come from any Kennel than from this. And no more powerful reason why every other breeder should decide now to aim for success with Bob Martin´s.